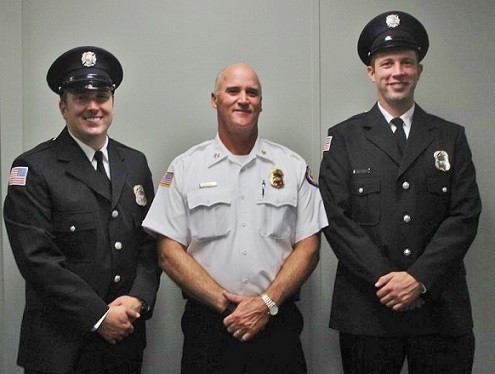 VILLA PARK – The Villa Park Board of Trustees welcomed the two newest firefighter/paramedics to the Villa Park Fire Department on Sept. 14, 2015. During the Board meeting, Villa Park Fire Chief Ron Rakosnik recognized Jeff Brown and Steve Lyons for completing their one-year probationary period with the department and achieving permanent assignment in Villa Park. Firefighter/Paramedic Jeff Brown, a Downers Grove South High School graduate, attended Southern Illinois University in Carbondale. Brown also worked as a part-time firefighter at the Pleasant View Fire Protection District and graduated from the Romeoville Fire Academy in March 2014. “Candidate Brown started here with very little fire and pre-hospital emergency services experience but what Jeff possessed was a very positive attitude and a desire to learn. Jeff showed up at the start of every shift with a smile on his face and a willingness to work hard and is highly regarded by his peers,” said Lt. Mike Barton of Brown’s service as a member of the Red Shift for the past year. Firefighter/Paramedic Steve Lyons, a St. Charles High School graduate, also graduated from the College of DuPage paramedic program with high honors. Lyons worked as a part-time firefighter at the Hampshire Fire Department and graduated from the Pingree Grove Fire Academy in February 2014. “Candidate Lyons has been an exemplary employee over the past year and is a great asset to the department,” said Lt. Ken Charapata of Lyon’s service as a member of the Black Shift. Both Jeff and Steve have received Office of the State Fire Marshal certification in Vehicle Machinery Operations and Fire Apparatus Engineer this year and together have completed over 1,300 hours of probationary training. “We are very lucky to have Jeff and Steve as full-time members of the Villa Park Fire Department to serve and protect the residents of Villa Park,” Villa Park Fire Chief Ron Rakosnik said.